A great blogger friend made a filled ravioli on his blog that inspired me and then I tried them fried instead of baked. He baked his and I thought I would give them a try this time. I will never fry them again! These are of course so much healthier baked. Thanks so much Greg and Curt for this inspiration. They are all gone the husband ate them all in one night! Make sure you go over and check out Crostini and Chianti on Greg's blog Click HERE, everything I made from his blog comes out fantastic. He made Nutella Ravoili with a raspberry sauce over the top that were outstanding! 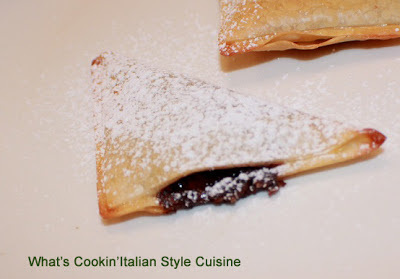 I made a bunch of these into crispy cookie like turnovers to take to work and these little gems a hit! Take the wonton flat, brush all the edges with egg wash. Place 1 teaspoon of Nutella in the center, fold into triangles. Brush tops with egg wash. Bake on 350 until light browned. I let cool and sprinkle powdered sugar on top. That't it! A crispy filled cookie like turnover! What a creative use of wonton wrap! They look irresistible! My family loves these as much as yours Claudia. Thanks for mentioning me. I am going to have to try Curt's version of Nutella. 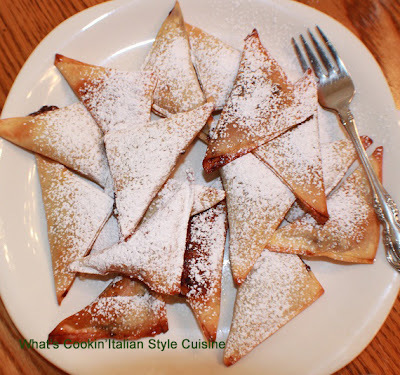 I've baked filled wontons before, but never with Nutella. Will def try these. OMG! this is such a treat! Impossible not to like nutella. I like these pastries! Those wontons are good for so many things. Oh good grief - this looks like something I could not resist! ;) Been on vacation and still have house guests from Canada until the end of the month. OMG…these sound so heavenly! Love, love nutella! I will have check out your son’s recipe! I know I will be making these!